This model is now supplied with a hard shell case (usually £25.99). The new Zeiss Terra ED 8x25 pocket binoculars have an operating temperature range of -20 to +63°C and with the waterproof body, these outdoor binoculars are a reliable companion even under extreme conditions. 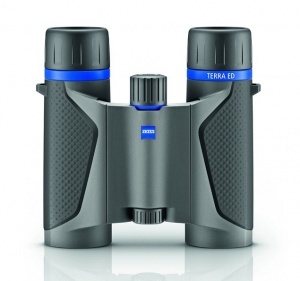 The Zeiss Terra ED Pocket 8x25 binocular feature 8x magnification and are easy to use due to the smooth, exact focusing system. Thanks to the folding design and the low weight of just 310 grams, the Zeiss Terra ED Pocket is extremely compact and can be easily transported. 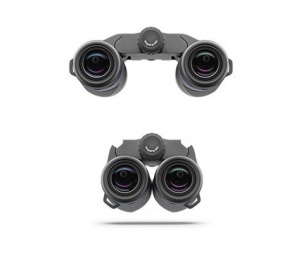 Simply put, these outdoor binoculars are made for everyone that wants to keep their eyes on the subject without dragging around extra weight. Combining SCHOTT ED glass with ZEISS MC coatings for pure, bright and vivid images, the Zeiss Terra ED Pocket 8x25 perform well even in low light. With 1.9 metres close focus and a wide-angle field of view, you’ll never miss a thing. Their extremely compact size aids mobility in the field making the 8x25 the ideal companion for observers who demand quality optics for open country observation. Superior Optics: TERRA ED Binoculars combine SCHOTT ED glass with ZEISS MC coating for pure, bright and vivid images, even in low light. Wide fields of view: You can quickly pick out individual animals from large groups and seek out hidden game in clumps of bushes. Precision at close quarters: Every TERRA ED model offers precise and unusually close focus down to 1.9 metres. Whether you are watching birds, insects or butterflies at close quarters, with the TERRA ED you will be able to see the finest detail in clear, natural, vivid colour. Optimal ergonomics: Comfortable observation is not just a matter of lenses. 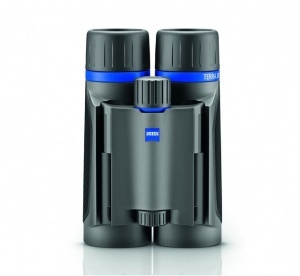 Ergonomics plays a major role, too – The TERRA ED shares the ZEISS binocular family's innovative modern design. The comfortable focus system with the large focussing wheel ensures easy handling, optimum grip and precise focussing even wearing gloves. The eyecups round off its ergonomic perfection. Slightly slanted, they are carefully aligned to aid observational comfort. Lightweight and Compact: The TERRA ED is both lightweight and extremely compact. You can be well prepared for any adverse conditions when observing nature. With a lightweight housing, the inner workings are perfectly protected, ensuring the long-term precision of the ED lens system. The TERRA ED - always a reliable companion ready for any tough use. Good things certainly come in small packages I am well pleased with these. Easy to use and crystal clear. Nice smooth focus and great eye relief. Yet to see better will not even bother to look further. Comes with case as well and made in Japan.